Every once in a while I am going to be posting some updates on projects that I am working on. I’m not sure how frequent I will be doing these types of posts, but it’s something that I want to keep doing as often as possible. This will include music I’m writing for myself and music for collaborative projects I’m involved with. I’m usually working on multiple things at once, so I’ll try to give a few previews and sneak peaks of the various things I’ve been doing. A lot of them are in their early stages, so this is going to be light on the details. The main project that I’m working on is an album that I hope to eventually release on Bandcamp. This will be my first attempt at writing a complete album rather than a short collection of pieces for a soundtrack. This should be an interesting challenge, but it’s something I’ve been wanting to do for a long time. The album is going be a concept album with a science fiction focus, primarily apocalyptic/horror science fiction. It will primarily be an instrumental work, but there may potentially be some vocals for a few of the tracks, depending on what happens during the writing process. I’ve got the basic narrative of the album planned, so I’m working on fleshing out those ideas and focusing on how I want to structure the music within that narrative. Because I’m in the middle of sketching out different ideas for individual tracks, there’s not a lot that I’m able to show you at this early stage. I’ll be revealing more once particular elements and assets are set for certain tracks. As far as the actual style of the music, it is currently a mixture of orchestral and electronic instruments. We’ll see how that ends up working out. I’m hoping to achieve a good balance/mix between the two that will work well throughout the entire album. A majority of my writing for this project is being done at the piano. As a classically trained pianist, I’m much more comfortable experimenting with chord progressions, melodies, and accompaniment ideas at the piano. Once I have a fairly good chunk of the music material and ideas sketched out, I usually move to my computer workstation to record, edit, and arrange the actual music for the tracks. 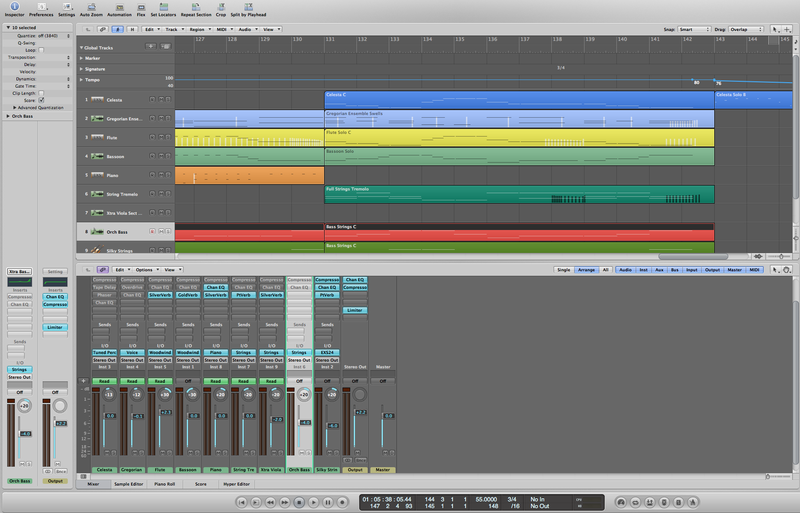 An earlier project I worked on in the Logic 9 DAW. Because a lot of the music for this particular project will be electronic, I’ve also been spending a lot of time learning all the intricacies of the synthesizers I have available to me. This includes a set of subtractive synthesizers, some FM synthesizers, and a few other instruments from virtual instrument libraries. I’m specifically focusing on making my own unique set of instruments and sounds. I do have a fairly decent set of virtual instruments available to me, but I prefer to either tweak those existing instruments or make new ones specific to what I want in my music. One of the simpler polyphonic synthesizers. The other project that I’m working on is a soundtrack for a currently unnamed videogame project. In addition to writing all of the game’s music, I’ve also been asked to provide some of the sound effects. This is my first time working on game sound effects, but so far it’s been a very interesting experience. It’s required me to look at sound production and creation in completely different ways. I’ve been experimenting with different parameters and I will likely end up applying some of these things I’ve learned to later projects. The game is a more retro-style arcade game so I’ve been specifically doing a lot of low tech game sounds. A lot of explosions and laser sounds. The soundtrack itself is taking a lot of inspiration from the SNES and Sega Genesis era in terms of instrument sounds and arrangement. In particular, melody writing has been a very important focus for this game soundtrack. It’s turning out to be a fun project and I hope I will be able to share more details on the game and the music soon. So that concludes my first update on some of the projects that I’m working on. Since many of these projects are in their early stages, I’ve only been able to give you a few details. That should change once more of them get closer to completion. These posts will be something I hope to continue doing as time goes on. This will hopefully include a few sample tracks and works in progress. It will all depend on how far along some of the music pieces are and how comfortable I feel sharing them. My goal for now is to do these types of updates at least once a month, if not more frequently. For now, I’ll get back to my writing and I will post more updates when I can. This entry was posted in Announcements and tagged music, Sega Genesis, SNES, video game music by Michael Hoffmann. Bookmark the permalink.